This project sought to address a number of production performance issues that affect egg incubation and early stage larval development in Yellowtail Kingfish and Southern Bluefin Tuna; low survival rates of larvae, the low incidence of swimbladder inflation that leads to high numbers of sinking larvae that soon die, the importance of light and lighting in determining the ability of larvae to feed, the high incidence of jaw malformation that results in substantial culling and wastage, all of which add to the cost of producing YTK fingerlings for growout and constrains further development of the industry. This project used a collaborative approach to try to understand the cause(s) and ways to mitigate a number of production performance issues that have affected Southern Bluefin Tuna (SBT) hatchery effort for the past 4 years, and Yellowtail Kingfish hatcheries. It was carried out at two hatcheries – the Arno Bay Yellowtail Kingfish R&D facility and the specialist research facility at Port Stephens Fisheries Institute. 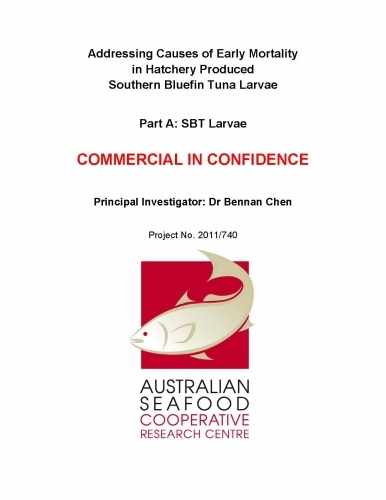 The experience and expertise of the researchers at Clean Seas Tuna, South Australian Research and Development Institute, Port Stephens Fisheries Institute, Institute of Marine and Antarctic Studies and the University of Tasmania combined extremely successfully.